Well, yesterday didn’t turn out as I expected. I’ve been following Jerry Coyne’s Why Evolution is True blog for a couple of years, so I know he likes to receive reader input on occasion. 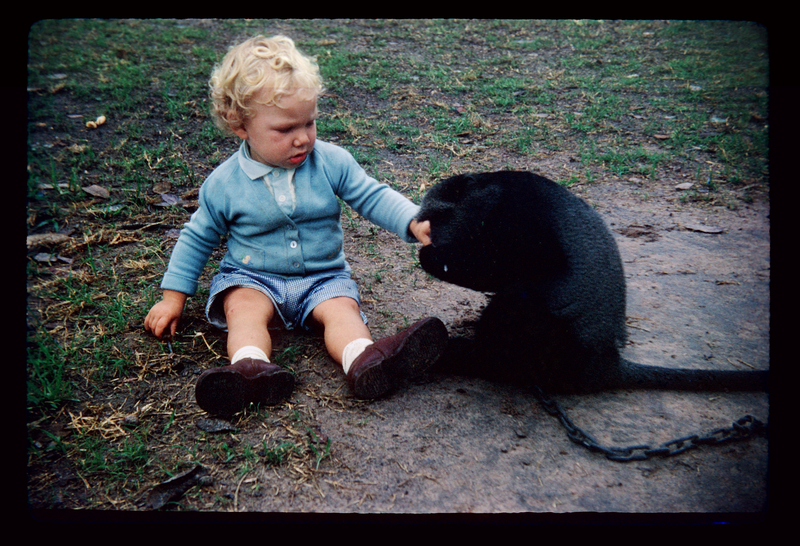 He had recently posted a link to a video on a child interacting with a gorilla at a zoo (http://whyevolutionistrue.wordpress.com/2013/08/27/so-human-in-aspect/) so I decided to send him this photo of me as a child interacting with a monkey in Zambia. Jerry responded very quickly and asked if I knew the species, I didn’t, but a quick search seemed to identify it as a Blue Monkey. I also gave Jerry a little detail about the circumstances of my family being in Zambia and why I was following his blog. Jerry immediately showed an interest in my story and asked for more detail. The result was a rapid brain dump of my experience of leaving my faith and a post on his blog (http://whyevolutionistrue.wordpress.com/2013/08/28/leaving-faith-behind-a-readers-story/). I am touched that Jerry thought my story worth telling and I fear that I have not given the it justice. There is much to tell and it is impossible to make it succinct. One thing that did become clear to me during my exchange with Jerry is that it has been far more emotional than I normally acknowledge. Not because of leaving the faith but because of the change in dynamics between those I love and call friends. It’s not that I am judged (at least I am not aware that I am) and it’s not that I am rejected (I’m not), it’s simply that on a basic level all my emotional interactions have changed and not always in an obvious way. Mostly it is in deeply subtle ways and it takes a long time to notice. As I hint in my piece for Jerry, I waver constantly in my attitude towards Christianity and over the years this has taken its toll too. This is stuff I need to process to make sense of. I’ve made the intellectual journey, that was easy; the harder part is now sifting through the results and I’m clearly not done there yet. That said; I’d like to thank Jerry for his interest and his kind offer to tell my story, it is appreciated. I’d also like to thank those who have come here from Jerry’s blog, the spike in visits has eclipsed my previous best day by a significant factor. I predicted 100x but I think it’s actually more like 50x. I have also gained some new subscribers, so thank you to you too. I am now off to read the comments on Jerry’s post, I suspect I’m in for some serious limey loving. Recently I watched a video from Discovery News on the phenomena of Near Death Experiences (NDEs). Video here (http://testtube.com/dnews/dnews-517-white-light), I recommend watching it before continuing, its only a couple of minutes and worth your time. It gives a very good summary of the current state of understanding of NDEs and its very interesting. For years NDEs have been jumped on by the religious community as being proof of an afterlife, specifically heaven. Over the years I have heard of several testimonies from people which included an NDE as part of the subject’s journey. They are always used as an indicator of the reality of heaven and the teller typically tells of a joyous sense of calm during the experience. It is worth noting that the testimonies I have heard on the subject have always been from a Christian perspective and so my knowledge of NDE reports is heavily skewed with that bias. Whenever I hear a story of an NDE I always think of this story (http://www.amazon.co.uk/Proof-Heaven-Neurosurgeons-Afterlife-ebook/dp/B008TTPQXA/ref=dp_kinw_strp_1) or at least one like it. I am sure the book I have heard of is a lot older than the book in that link. From the perspective of many Christians, stories like this are seen as tangible proof of the divine and when someone has an experience like that and tells it in Christian terms it can provide very real encouragement and confirmation to those who sometimes struggle with their faith. Thinking back to my Christian days, I’m asking myself how I felt about NDEs, there were certainly times when I never doubted that they were real and that people were provided with a glimpse of heaven. However, there were also times when I found myself wondering about the details that were occasionally provided. These are now so long ago that I honestly can’t say what effect they had on me at the time. With this latest scientific research I find myself being relieved that there is an explanation that makes sense. Though I do also find myself wondering how the believing Christians will respond to this news.